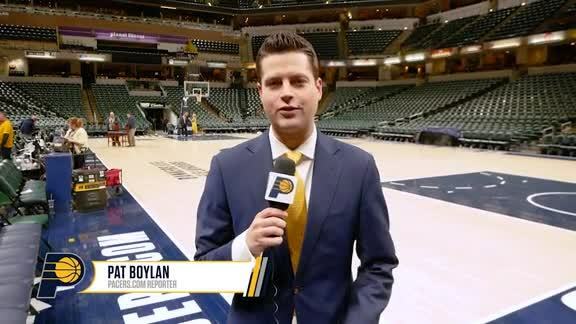 May 1, 2018 - Pacers President of Basketball Operations Kevin Pritchard spoke with Pat Boylan of Pacers.com and discussed his pride in the 2017-18 season, as well as his expectations for the summer. 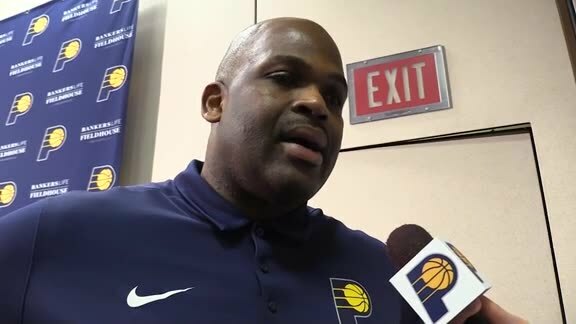 May 1, 2018 - After a 48-win season, Pacers head coach Nate McMillan talked with Pat Boylan of Pacers.com. McMillan talked about what he saw from his team this season and what he'd like the group to focus on throughout the offseason. 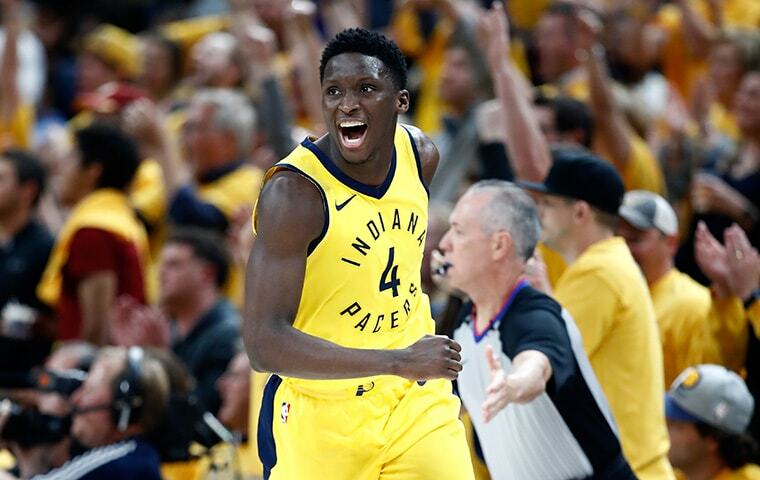 May 1, 2018 - Pacers President of Basketball Operations Kevin Pritchard shares a few anecdotes that highlight the unique characteristics of All-Star guard Victor Oladipo. 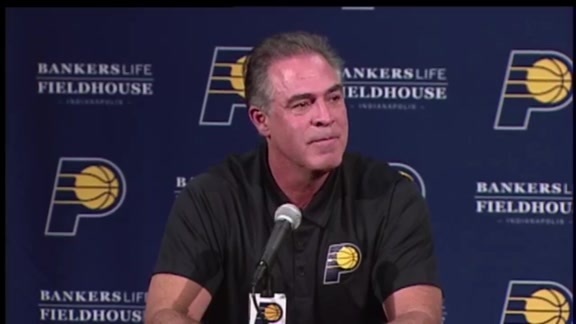 May 1, 2018 - Pacers President of Basketball Operations Kevin Pritchard discusses the value of Thaddeus Young and Cory Joseph, both of whom have player options for the 2018-19 season. 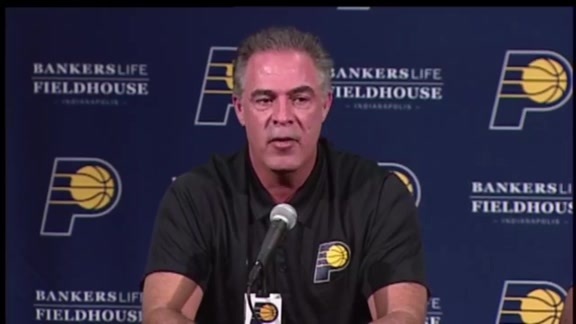 May 1, 2018 - Pacers head coach Nate McMillan and President of Basketball Operations Kevin Pritchard discuss the development of young centers Myles Turner and Domantas Sabonis. May 1, 2018 - Pacers President of Basketball Operations discusses the impact Darren Collison, Bojan Bogdanovic, and Al Jefferson had on the 2017-18 team. 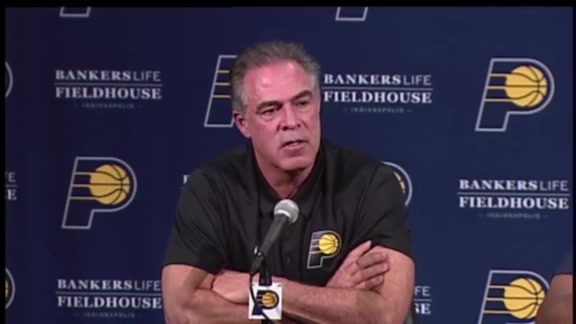 May 1, 2018 - Pacers President of Basketball Operations Kevin Pritchard reflects on the 2017-18 season and thanks Pacers players, coaches, staff, and fans in the opening statement of his postseason press conference. 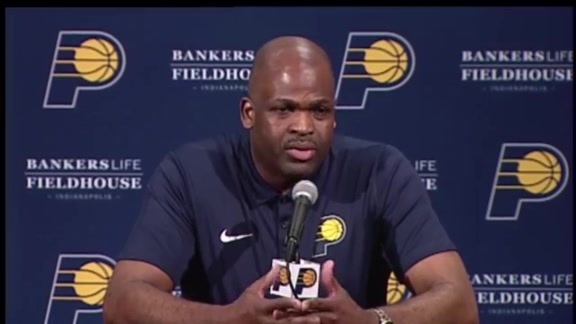 May 1, 2018 - Pacers head coach Nate McMillan reflects on the 2017-18 season and how his team was able exceeded external expectations in his postseason press conference. The wounds of Sunday's season-ending loss are still fresh, and he's headed for a summer filled with decision-making. For the moment, however, Kevin Pritchard wanted to take a few moments to reflect on the season just ended. The first Pacers team bearing his fingerprints far exceeded general expectations by winning 48 games and taking Cleveland to seven games in the first round of the playoffs. Its locker room culture was perhaps the best in franchise history, and it captured the collective heart of the public with its camaraderie and enthusiasm. 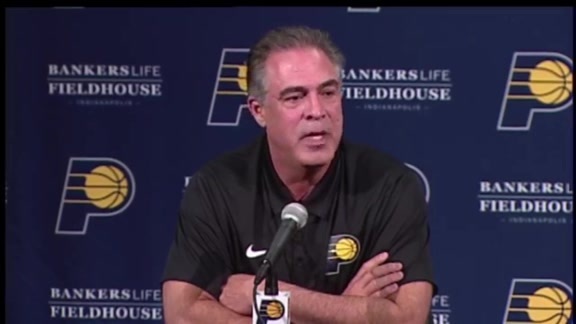 "These teams don't come around very often," Pritchard said Tuesday, when he and coach Nate McMillan met with the media at Bankers Life Fieldhouse. "I've never had a team like this. They just were fun." It was a season so heartwarming for the Pacers President of Basketball Operations that he wanted to take a few days to savor it, with a glass of wine, he said. Soon enough, however, he'll dive into an off-season best defined by "optionality" — his word for the myriad roster conclusions that will have to be made. Some will be made for him. Thaddeus Young and Cory Joseph, both integral parts of the team's core, have player options on their contracts and can become free agents. The Pacers, meanwhile, have options on the final season of the contracts of Darren Collison, Bojan Bogdanovic, Al Jefferson, Lance Stephenson, and Joe Young. Glenn Robinson III and Trevor Booker are unrestricted free agents who could be re-signed. Pritchard hasn't begun to talk with McMillan or his executive staff about the impending decisions. Exit interviews with the players were conducted on Monday and plenty of time remains to prepare for the draft, free agency, and potential trades — more than they wanted, given the Pacers' first-round exit from the playoffs. Still, they were encouraged by the season, and the reaction to its ending on Sunday. "When I was looking around the (locker) room I've never seen so much disappointment and sadness," Pritchard said. "A lot of times in an NBA season there can be a little relief. I can promise you, there were 17 players who were hurt to their bones, marrow deep, and a few of them were in tears. "In my 26 years (in the NBA) I've never been around a team that brought it like they did this year. They had each other's backs." The primary dilemma facing Pritchard and his staff is whether they risk fracturing their rock-solid locker room culture by bringing in significant new players to try to get better on the court or leave a good thing mostly alone and rely primarily on internal improvement from young players such as Victor Oladipo, Myles Turner, and Domantas Sabonis. "We're looking at all the options," he said. "Do we go big-game fishing this summer, (which) will cause us to lose some of the players we have here? Or do we keep this basic team together, maybe add a few peripheral pieces, (and then) have $50-70 million in cap space the following year? "There are times you have to shove the chips in and say, 'Let's do it.' In my mind, over the next couple of weeks, that will be the precipice of what I'm thinking about. Is it time for us to get aggressive and add that player or players or do we keep these really good human beings, really good players who know their role, and let Myles and Domas and Victor be the shining lights that have to improve?" The Pacers' cap space could help facilitate trades with teams looking to shed salary. Contracts do not have to match within a range if one team is under the cap. "The trade market could be better than ever," Pritchard said. "There's not many teams with cap space this summer and when that happens normally teams get aggressive with trades to change their team. How aggressive we'll be, I don't know yet." Contrary to the perception of some, Pritchard believes the Pacers can attract significant free agents with the potential of their young core and their practice facility. "I think they're going to recognize this roster has a chance to win," he said. "Winning brings players more than anything except the beach. The beach tends to win everything. Other than that, we can (offer) a winning culture and that's what we want to do." Pritchard's decision-making process will depend largely on what players are available in trades or free agency. Pritchard can get significantly under the cap by not re-signing his players with team option contracts. The free agent marketplace will be better in 2019, but more teams will have cap space then, creating a more competitive marketplace for teams. Young and Joseph will largely determine what Pritchard called the "decision matrix." If they decide to complete their contracts with the Pacers, Pritchard will have less money available for free agency. If they opt out and become free agents, Pritchard's options in the free agent marketplace expand significantly. They also could become free agents and sign longer-term contracts with the Pacers. Both told Pritchard and McMillan on Monday they want to return to the Pacers, although such desires can be swayed by financial incentives. "We like those guys, we'd like to have them back," Pritchard said. "Both of those guys are core to what we do." Pritchard is grateful not to have to worry about Victor Oladipo, his lone All-Star this season. Oladipo averaged 23.1 points, led the NBA in steals (2.4), and proved his value mostly by his absence. The Pacers didn't win any of the seven games he had to miss, and usually didn't even come close. Oladipo was the first player to arrive at the St. Vincent Center on Monday. Not just for an exit interview, but to work out. Pritchard said Oladipo put up a couple hundred shots and then put in a serious workout. "He walked over to me and said, 'This is just the beginning. I'm going to take my workouts to the next level,'" Pritchard said. Pritchard called Oladipo a "superstar player" and "one of the most unique human beings around." He hopes Oladipo's optimism and work ethic rubs off on his teammates, present and future. He recalled Oladipo coming to practice whistling and singing during losing streaks, when things looked rather bleak. 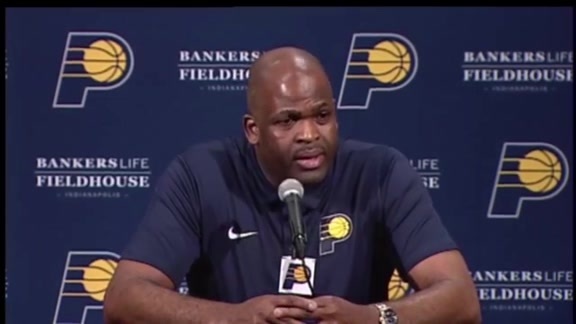 "I've learned from Victor Oladipo, no matter how your day goes, no matter what's going on in your life, you always have the right to hit the reset button," McMillan said. "Victor pulls everybody up. His positivity pulls everybody up." The Pacers, meanwhile, are challenging Oladipo to build on this season. When Oladipo walked in for his exit interview with Pritchard and general manager, Chad Buchanan, they serenaded him with a recording of Milli Vanilli's lone hit song, "Girl You Know it's True." "What song is that?" Oladipo asked. "That's the biggest one-hit wonder that's ever happened," Pritchard said. "Are you a one-hit wonder? Was this a one-year deal?" "I'm more Michael Jackson," Oladipo said. "We've got something special here," Pritchard told the media. * Pritchard became choked up and had to pause to gather himself while praising McMillan. The two go back to their time together in Portland. "I couldn't be prouder to be working next to a man like this," Pritchard said. "I saw a different Nate this year. I challenged him every week to try to enjoy, for lack of a better word, the process, and to develop the heck out of this team." 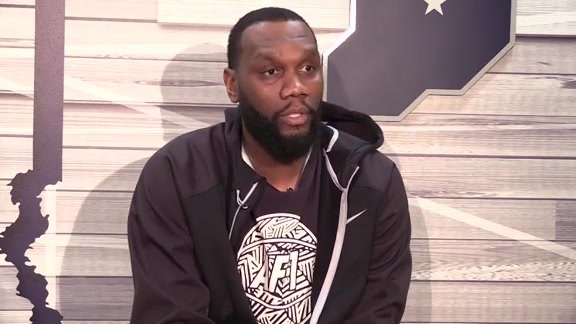 * Although Al Jefferson is owed a substantial amount in the final year of his contract and was the team's third-string center this season, Pritchard doesn't rule out the possibility of honoring the final year of his contract. Jefferson played a crucial role as a mentor and locker room sage during the season. "I'm suited for this. This is what I'm about," he said in his exit interview. "We may have Al back next year," Pritchard said. "I wouldn't discount it. I'm not saying for sure we will. He made sure when Lance got a little crazy, he would bring him back. The coaches do a great job of that, but at the end of the day, the players patrol it as well as anybody and that's Al Jefferson." * Pritchard said the exit meetings with players lasted between 15 and 30 minutes each, and were interactive. "We didn't ask them about the season, we asked them what the organization can do better," Pritchard said. "It was a different vibe in those meetings. Our players are very open and honest. The overall theme was we love it, we do a lot of things well, but we want to be great. I told the players this is our chance to be coachable. We have a laundry list of things we want to do better." * McMillan expressed optimism for last year's first-round draft pick TJ Leaf, who played sparingly as a rookie. Leaf averaged 2.9 points in 53 games but proved himself as a shooter by hitting 43 percent of his 3-point shots. 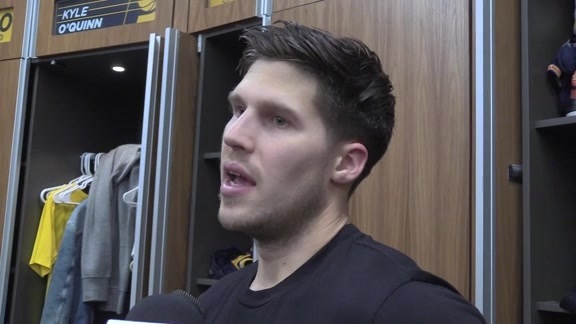 McMillan said Leaf's opportunities were limited by the emergence of Sabonis, the decision to play Bogdanovic occasionally at power forward and Leaf's need to get stronger and defend his position. "I like his potential," McMillan said. "His basketball IQ is very high. "I think this is a very important summer for him. He has the length, he has the ability put the ball in the basket, put the ball on the floor. He's a legit spread four in this league. He'll get stronger. I like him." * McMillan believes the experience of losing to the Cavs in the opening round will pay dividends in the future. Teams generally go through a process in the playoffs, taking gradual steps. Although the Pacers have lost in the first round the past three seasons, this was essentially a new team that was starting over. "The experience they got, that's going to make us better, that's going to make us stronger," McMillan said. "I can talk about what they're going to experience, but...that's the best experience they can get, having the opportunity to play in that seventh game against Cleveland and LeBron. "Nobody was giving us a chance. That experience, to see them after the game, and the bus ride to the airport...I mean, nobody was saying anything. l talk with these guys yesterday, they were very disappointed. They know they have to improve, and that was the main thing each of them talked about. What they can do to get better, so they can go further next season." Mark Montieth's book, "Reborn: The Pacers and the Return of Pro Basketball to Indianapolis," covers the formation and early seasons of the franchise. It is available at retail outlets throughout Indiana and online at sources such as Amazon and Barnes & Noble.